Kick off your visit on the 24th (Mon): pause for some serene contemplation at Cattedrale di Matera, Head underground at Casa Grotta di Vico Solitario, then contemplate in the serene atmosphere at Church of Santa Maria de Idris, and finally get to know the fascinating history of Sassi di Matera. To see where to stay, ratings, and tourist information, read Matera online visit planner . Sydney, Australia to Matera is an approximately 28-hour combination of flight and bus. You can also do a combination of flight and train. The time zone difference moving from Australian Eastern Standard Time (New South Wales) to Central European Time is minus 9 hours. Expect much hotter weather when traveling from Sydney in August: highs in Matera hover around 36°C, while lows dip to 22°C. Finish your sightseeing early on the 24th (Mon) to allow enough time to travel to Forio. Kick off your visit on the 25th (Tue): steep yourself in history at Sant'Angelo (Serrara Fontana), take advantage of the amenities at Bagno Franco, then pause for some serene contemplation at Basilica Di Santa Maria Di Loreto, then take in the architecture and atmosphere at Chiesa del Soccorso, and finally take in the architecture and atmosphere at Chiesa dell’Arciconfraternita di Santa Maria Visitapoveri a Forio. For other places to visit, traveler tips, maps, and other tourist information, go to the Forio trip planner . Traveling by combination of car and ferry from Matera to Forio takes 4.5 hours. Alternatively, you can do a combination of bus and ferry. Plan for a bit warmer nights when traveling from Matera in August since evenings lows in Forio dip to 26°C. Wrap up your sightseeing on the 25th (Tue) to allow time to travel to Anacapri. Anacapri is a comune on the island of Capri, in the Metropolitan City of Naples, Italy. 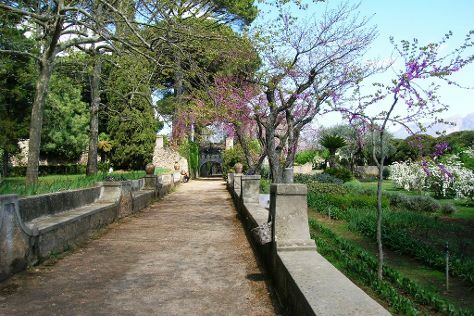 On the 26th (Wed), take in the spiritual surroundings of Chiesa San Michele, hike along Fortini Coastal Walk, then get engrossed in the history at Villa San Michele, then make a trip to Giardini di Augusto, and finally take in the dramatic natural features at I Faraglioni. To find where to stay, more things to do, ratings, and other tourist information, go to the Anacapri travel planning website . You can ride a ferry from Forio to Anacapri in an hour. In August, daytime highs in Anacapri are 36°C, while nighttime lows are 26°C. Finish your sightseeing early on the 26th (Wed) to allow enough time to ride a ferry to Ravello. Ravello is a town and comune situated above the Amalfi Coast in the province of Salerno, Campania, southern Italy, with approximately 2,500 inhabitants. On the 27th (Thu), tour the pleasant surroundings at Spiaggia di castiglione, then admire the natural beauty at Villa Cimbrone Gardens, then don't miss a visit to Villa Rufolo, and finally contemplate in the serene atmosphere at Duomo di Ravello. Here are some ideas for day two: kick back and relax at Lido di Ravello, stroll through Fornillo, then take in the spiritual surroundings of Duomo di Sant'Andrea, and finally take in the spiritual surroundings of Parrocchia San Giovanni. To find where to stay, traveler tips, photos, and tourist information, go to the Ravello driving holiday site . Traveling by ferry from Anacapri to Ravello takes an hour. Alternatively, you can do a combination of ferry and taxi; or do a combination of ferry and bus. In August, plan for daily highs up to 34°C, and evening lows to 28°C. Finish your sightseeing early on the 28th (Fri) so you can travel to Paestum. Start off your visit on the 29th (Sat): delve into the distant past at Temple of Athena, take in the spiritual surroundings of Parrocchia Ss. Annunziata, take an in-depth tour of Archaeological Park of Paestum, then explore the ancient world of Il Tempio di Nettuno o Poseidone o di Hera II, and finally explore the ancient world of Paestum Ruins. To see reviews, other places to visit, ratings, and other tourist information, you can read our Paestum trip planner . You can do a combination of taxi and train from Ravello to Paestum in 1.5 hours. Alternatively, you can drive; or do a combination of bus and train. In August in Paestum, expect temperatures between 34°C during the day and 28°C at night. You'll have a few hours on the 30th (Sun) to wrap things up before traveling home.